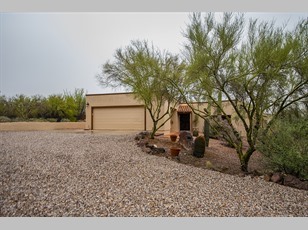 Gorgeous Home Nestled on Tucson's Westside! 4 bedroom 4 bath on over 1 acre With a Pool! This is a Gorgeous home with 4 bedrooms and 4 bath, 2-car garage, Beautiful pool, Granite kitchen counter tops and extra large Living room/Dining room area is shear perfection! His and hers closets in Master bedroom, two Private Balconies, Super functional Laundry room and Stunning views! Horses are allowed, zoned C-1. All of this on 1.15 Acres!! !